Dark Guitar Chords To Spook Your Listeners! Music, like language, can be used to convey a wide range of emotions. Darkness and tension in music is just as important as light and uplifting sounds, as the two complement each other in a kind of "yin and yang" way. Creating a feeling of uneasiness or foreboding in your listeners (and yourself) might seem a bit sadistic, but it can actually be cathartic and make the move into lightness all the more profound and satisfying. Tension and release has been used in music for hundreds of years to stir up complex emotions and take the listener on a journey. Exploring the darker sounds of your guitar will help to tune your ear to this difference in emotional response. A good place to start is with chords. The chord chart in this lesson is unlike others, as it focuses specifically on chords that take you to the darker side of musical expression! When notes are played together, they can create both harmony (which translates to a relaxed and light feeling) and dissonance (which translates to tension, heaviness and darkness). What the chords in this lesson do is combine harmony with a touch of dissonance (e.g. just one dissonant note in the chord). The combination of these two elements creates a feeling of discord, or that something "isn't quite right" - the comfort of harmony being "upset" by the discomfort of dissonance. Dissonance doesn't quite have the same effect when ALL the notes clash. It's when we mix harmony with dissonance that things really start to sound devilishly dark. So, for example, throw a minor second (♭2 or ♭9) interval in to a major chord (i.e. moving the octave root up by a semitone) and suddenly that bright and warm major sound gets an injection of tension and darkness. Similarly, add a major sixth (6 or 13) or major seventh (7) to a minor chord for a colder, more tragic minor sound. The listener hears a conflict between the sweetness of harmony and the bitterness of dissonance, which translates to uneasiness and perhaps a feeling of wanting resolution. You can either give them that release (e.g. by going back to a more harmonious, stable chord), or you can prolong the tension... depending on the response you want. While there are no "rules" as such, there's a general concept - an awareness of what creates musical tension and relaxation. As you play through the chords, see if you can pick out the notes that give the chord its dark sound. Try changing that note by moving it up or down a fret (or two) and listen to how it changes the colour of the chord. You might find that, without the "tension note", the chord is just a regular major, minor or 7th chord. The purpose of this exercise is to tune your ear to what creates the dissonance, so when you hear it in music, you'll have a better idea of what's going on. Down the line, this could, for example, translate to targeting these tension notes in a solo piece. You'll notice we have many voicing options when we use open (unfretted) strings. There's a lesson in this alone - open strings can help you create chord voicings that would otherwise be unachievable (i.e. physically impossible for us four-fingered humans). So experiment with shapes up and down the neck keeping strings open. That's how I discovered the chords below. Of course, alternate tunings can help to create voicings that would be unattainable in standard tuning, and I encourage experimentation with these. 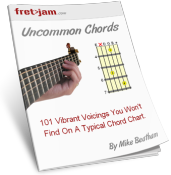 But I've stuck with standard tuning here as this is the most common tuning and gives you the broadest base of voicings that can work with more familiar shapes. Try replacing regular major or minor chords in progressions with a dark chord, especially when you want to create tension. In most cases, you won't want to over-do it, so keep it special! If you can pick out the dissonant or "darkening" tone in the chord, try moving to it from a fret down or up. For example, if you raise the 3rd string (G) in the open C major shape to the 1st fret, you get that light-dark transition I mentioned earlier. If you move the 3rd string in E major up two frets, you get a similar interplay between tension and relaxation. Move from major to minor on the same root (e.g. A major to A minor), using a minor voicing from the chart above, for an especially dramatic darkening effect. It will take some experimentation to find the right chord for this, but once you hear it, you'll know! If you're playing with another instrument, and the chord is a straight major or minor (i.e. just the three note triad), you can use the more complex voicings from the chart to colour that basic major/minor sound. One of the great things about one instrument keeping the chords simple is that the other(s) can build on it quite freely with extensions (extra notes). This is a common dynamic in jazz music. If you're a more advanced player and want a real challenge, see if you can identify the tension note in the chord and then adjust the scale you would usually play to accommodate that note. This could involve raising or lowering a note in the scale from its "natural" position. I'll cover this in a separate lesson. Share Your Own Dark Guitar Chords! Oolimo is, in my opinion, the best chord tool on the web, and it's free! 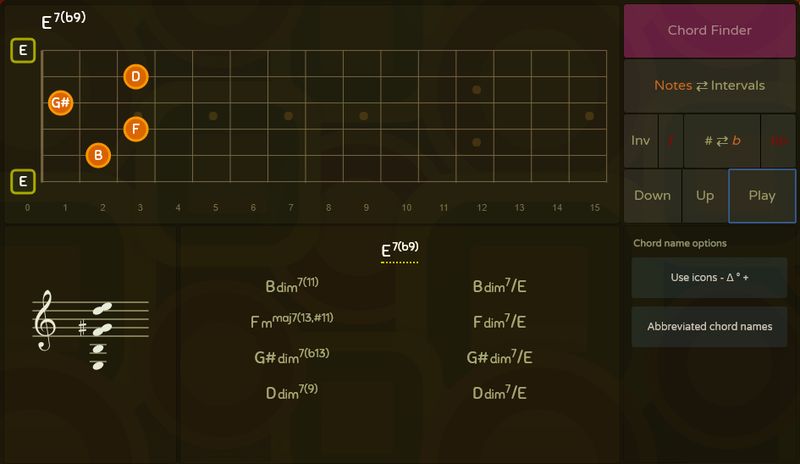 You can choose either to display notes or intervals (right hand menu), depending on your preference. Alternatively, if you know how, take a screen grab and crop the image so it includes only the chord diagram. Once the image has uploaded, a small thumbnail and image link will appear to confirm. Add a comment if you like (e.g. 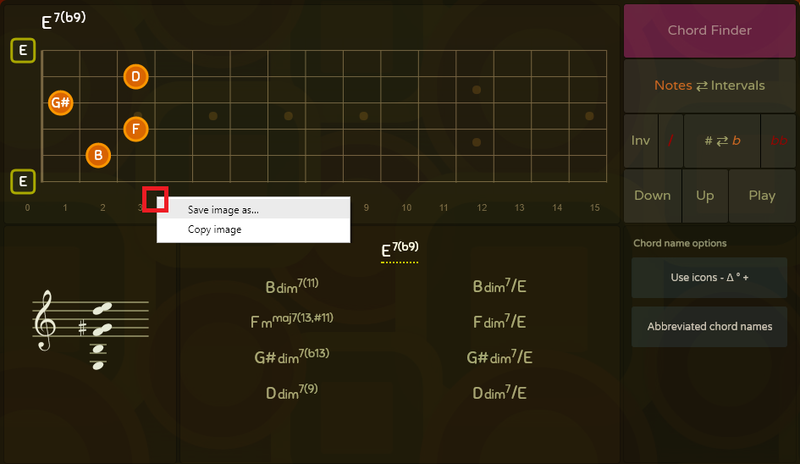 tell us how you discovered this chord) and you can then post your diagram/comment for all to see!